In stock -This product will ship today if ordered within the next 2 hours and 53 minutes. Hydrea London Bamboo Nail Brush with Mane and Cactus Bristle is made from eco-friendly bamboo. The oval shape is easy to hold and a jute string loop allows this to be hung when not in use. A basic yet quality-made essential, this Hydrea Natural Bamboo Nail Brush is a must have accessory. Below are reviews of Bamboo Nail Brush with Mane and Cactus Bristle by bodykind customers. If you have tried this product we'd love to hear what you think so please leave a review. 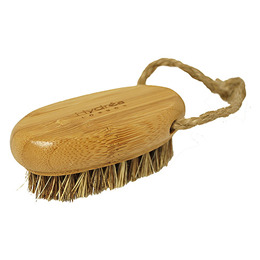 Hydrea London Bamboo Nail Brush with Mane and Cactus Bristle is made from eco-friendly bamboo. The oval shape is easy to hold and a jute string loop allows this to be hung when not in use.